If you stopped by our booth at Expo East, you probably tried one of our many delicious cakes. Our visitors got to choose from Autumn Spice Cake, Vegan Carrot Cake, and our savory Margherita Cake. 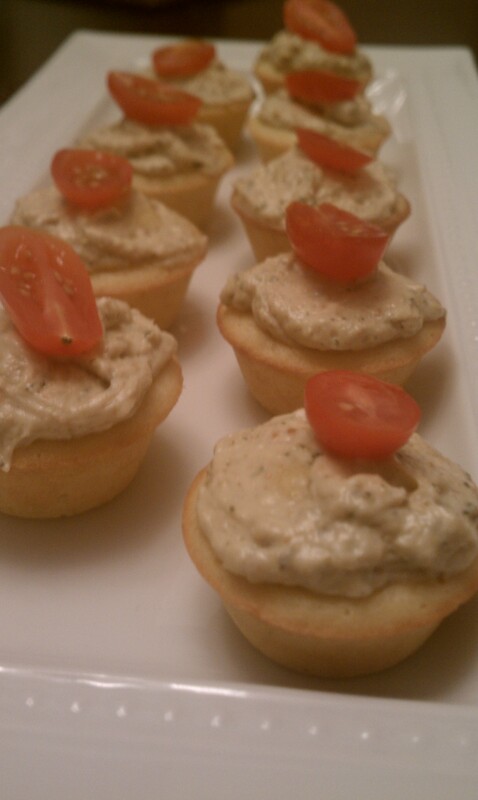 While its appearance confused a few (some expected sweet from this “cake”) everyone really liked the sundried tomato, mozzarella, basil bread with pesto cream cheese “frosting.” This is a super easy to make appetizer for your next get together, and it is great warm or at room temperature. We made sheet cakes for expo, but it makes great cupcakes too! Top each piece with a sliced grape tomato and a basil leaf for an extra fancy touch. Thanks to Carma’s Café in Baltimore for sharing the recipe! NOTE : All ingredients should be room temperature or warmer. Grease and flour a 9×12 pan. Set aside. Mix flours, baking powder, salt and black pepper together in a bowl. In mixer bowl, beat oil, eggs, cheeses, sundried tomatoes, basil and warm milk. Gently stir flour mixture into wet ingredients. Bake until a toothpick inserted in the center comes out clean, 30-35 minutes, depending on the size of your pan. Remove to a cooling rack. 2 parts cream cheese to 1 part store bought pesto, mixed well with a stand mixer.